Figure 7.16 Palynostratigraphy and magnetostratigraphy of the Kiowa Core showing position of the K-T boundary at 993.85 ± 0.05 ft (302.93 ± 0.015 m) and magnetic polarity subchrons identified; depths in feet; D1 and D2 sequence terminology after Raynolds (2002). Tricolpites microreticulatus Belsky, Boltenhagen, and Potonie 1965 Trisectoris costatus Tschudy 1970 Tschudypollis retusus (Anderson 1960) Nichols 2002 Tschudypollis thalmannii (Anderson 1960) Nichols 2002 Tschudypollis spp. Denver Basin K taxa is given in Table 7.2). The placement of the K-T boundary by palynology was verified by the presence of shocked quartz (Nichols 2002b). Paleomagnetic study (Hicks et al. 2003) showed the K-T boundary in the Kiowa Core to be just above the middle of magnetic polarity subchron C29r (Figure 7.16). A fern-spore spike is present just above the palynological extinction level (97.5% fern spores, of which more than 90% are Cyathidites). The abrupt change in palynofloral composition from uppermost Maastrichtian to lowermost Paleocene is striking. 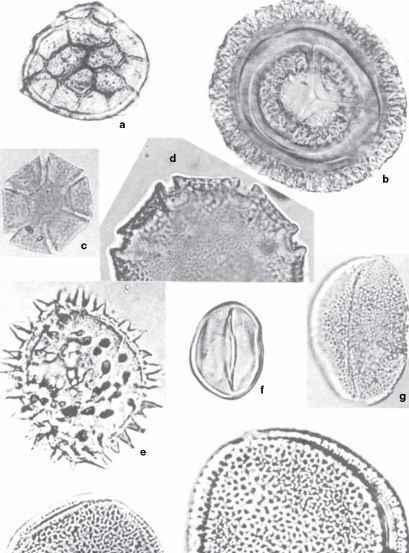 Assemblages in the four higher 3-mm-thick samples continue to be dominated by Cyathidites spores, but specimens of the fern-spore genera Laevigatosporites and Toroisporis are present in increasing numbers. A sample 9 cm above the K-T boundary appears to have a secondary fern-spore spike composed of 62% Laevigatosporites spores. Front Range (Barclay et al. 2003). We regard this locality as the most complete single K-T boundary section known in nonmarine rocks. This claim for the West Bijou Site is based on the boundary being characterized by a palynological extinction level (extinction of 21% of characteristically Maastrichtian taxa), a fern-spore spike 1cm above the extinction level (peaking at 74% Laevigatosporites), an iridium anomaly (6.8 ppb), and shocked quartz (Figure 7.17). In addition to these now-familiar features, on a broader scale the locality has leaf megafloras in Maastrichtian rocks below and in Paleocene rocks above the boundary, dinosaur teeth and bones below it, and a distinctive lower Paleocene (Puercan 1) mammal jaw above it. Paleomagnetic data places it within subchron C29r, and radiometric dates from volcanic ash beds bracket the K-T boundary (Hicks et al. 2003). Paleocene plant megafossils from the West Bijou locality were described in Barclay et al. (2003); see Figure 7.18. More than 20 Paleocene leaf localities were quarried and 4 were quantitatively collected. The dominant species at these localities are taxa that are known from the basal Paleocene sequences in New Mexico, Wyoming, Montana, the Dakotas, and Saskatchewan. Johnson and Hickey (1990) described this flora as the FUI (Fort Union I) megaflora and noted that it occurred immediately above the K-T boundary and persisted for at least 80 m into Paleocene strata. Peppe et al. (2005) have shown the upper limits ofthe FUI flora in North Dakota to be at the base of polarity subchron C28n or about 64 Ma. Interpreted as the post-fern-spike recovery megaflora, this assemblage of 20 recognizable taxa includes a group of 6 taxa that appear to dominate the vegetation at the center of the Laramide basins for a considerable period of time after the extinction event (see Table 5.1). Until 1994, this simple pattern of a rich and heterogeneous Cretaceous megaflora followed by a depauperate and widespread Paleocene megaflora seemed to be valid.